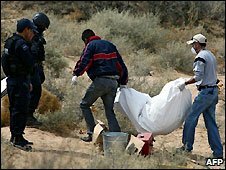 Mexican police have found at least nine unidentified bodies on the outskirts of Ciudad Juarez, near the US border. Officials say the bodies, which were partially buried in a desert area south of the city, showed signs of torture. Ciudad Juarez is Mexico's most violent city. Fighting between drug gangs has led the government to send thousands of troops to patrol its streets. About 1,600 people were killed in the city last year as criminals fight to control drug routes into the US. More than 1,000 people across Mexico have been killed already in 2009, about one-third of them in Ciudad Juarez. Beheadings, attacks on police, and shootings in clubs and restaurants are a daily occurrence in some regions. Five severed heads were found in ice coolers by the side of a road in the central state of Jalisco on Tuesday, with notes addressed to rivals of the killers, who were assumed to be involved in the drug war. Some police forces across the country have been corrupted by the rich drug cartels and journalists who report on cartel activities have been targeted. Since December 2006 the Mexican government has deployed a total of about 40,000 troops and police to fight the country's drug cartels. The Mexican government holds that the violence wracking the country is a reflection of its success in tackling the drug gangs, which have been rendered leaderless and reduced to fighting for fewer spoils. Others argue that the cartels have become so powerful that they effectively control some parts of the country, and the violence is evidence of their gang law.